Club Penguin Cheats by Mimo777 Club Penguin Cheats by Mimo777: Club Penguin October Membership Page! 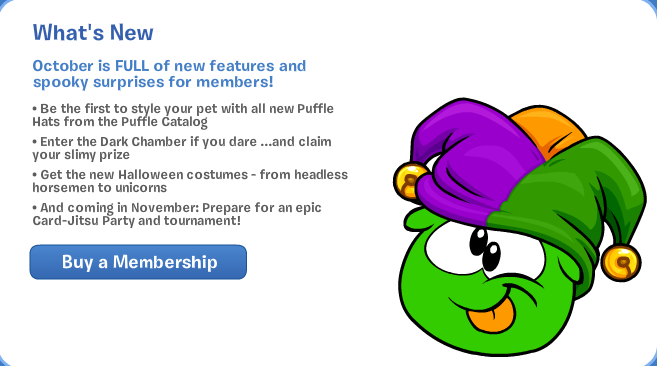 Club Penguin October Membership Page! Lots of sweetness! Gotta love the upcoming Card-Jitsu Party and tournament! Club Penguin Puffle Hats Reviewed By You! Club Penguin November Membership Page! Club Penguin Box Portals Video! Club Penguin Limits Friends List to 100!! Club Penguin Friends List Bugs! Club Penguin Loggin and Beta Team Games Added! No More Club Penguin Buddies? The Club Penguin Field Op Number 53! Club Penguin Times Issue #314! Club Penguin New Chat and Friends! 2011 Club Penguin Anniversary Party Cheats! 2010/2011 Club Penguin Yearbook Cheats! Club Penguin's Halloween Party Don't Miss List! Club Penguin Night of the LIving Sled Video! 2011 Club Penguin Halloween Party Cheats! Club Penguin Pin Cheat - CRYSTAL BALL PIN! Club Penguin Field Ops 52 Cheats! Club Penguin Halloween Igloo Decorating Contest! Club Penguin October Parent Update! Club Penguin Membership Price Update! CLub Penguin Halloween Party 2011 Commercial! Club Penguin Puffle Launch Reviewed By You! Club Penguin Video Blog By Liam! Club Penguin Spooky Music Update! Club Penguin Field Ops 51 Cheats! Club Penguin Puffle Handler Guide! Club Penguin TImes Issue #312! Club Penguin Halloween Start Up Screen! Club Penguin Puffle Handler Arrives Tomorrow! Club Penguin Get Connected Video! Club Penguin Puffle Experience Improvement! Who is "Nickname" on Club Penguin? Club Penguin Log In Glitch! Club Penguin Pumpkin Head Cheat! Club Penguin Halloween Sneak Peek and Video Blog! New Mimo Club Penguin Contest! Random Mimo! Club Penguin Plush Puffles With Hats! Club Penguin Nyan Puffle Part 2 Video! Club Penguin Puffle Updates and Furniture Cheats! Club Penguin Pin Cheats - FENCE PIN! Club Penguin Treasure Book In Gift Shop! Club Penguin Field Ops Number 50! Club Penguin Times Issue #311! Puffle Hats Start Up Screen! Club Penguin Puffle Hats and Fair Update! Club Penguin October Pay Day!